Social media blast Commissioner. "KIEMS kits and Media results are false, Verified Forms 34B are true." -Prof Abdi Guliye, IEBC Commissioner. - Bana Kenya News, Real African Network Tubanane. Home featured Social media Social media blast Commissioner. "KIEMS kits and Media results are false, Verified Forms 34B are true." -Prof Abdi Guliye, IEBC Commissioner. Social media blast Commissioner. "KIEMS kits and Media results are false, Verified Forms 34B are true." -Prof Abdi Guliye, IEBC Commissioner. The IEBC has said that the 7.3Million votes Uhuru Garnered is fake and it will stick to their information. The IEBC commissioner Abdi Guliye said that the results transmitted through the KIEMS kits are not true as other people were identified through Identity cards only not the machine. "Some of the voters were identified using the voter's card, Identity card or Passports only not through the KIEMS kits. So the votes may not be true when you follow the KIEMS kits total number. The voter turnout on the KIEMS kits is not true but what we are verifying now is true." Commissioner Abdi Guliye said. "What was the use of the KIEMS kits if Identity cards were enough in voter identification? They are now manufacturing and doctoring results as the KIEMS kits have ashamed the IEBC Commision." Says Siaya Senator James Orengo. 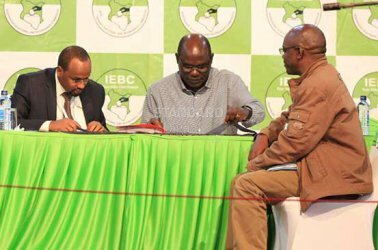 The IEBC declared 48Percent as an approximate of the vote turnout later the IEBC Chairman tweeted 33 Percent as turnout, later moved to 27 Percentage and currently it has reached 45 Percent. Kenyans have been bored with the Doctoring and the Media blackout in the verification. The IEBC Chairman Wafula Chebukati has said that the results on the social media and on the live media are fake. Only IEBc will give out the real figures. Now commissioners are saying the real truth. KiEMs kits has 2.5m casted votes but form 34B wch they have forced RO's to fill has 7.5m votes. Wait ! How now! A. )If we are talking about turnout, that is on F34A as well as on the KIEMS. If not how did people access polling stations? Use forged 34B to rectify what KIEMs didn't portray! Funny. When i was taught to be a PO/DPO we were told if someone's name is not in the KIEMS they should not be allowed to vote. These @IEBCKenya folks are taking us for fools. If over 4M p'ple voted on 26/10, we should have seen queues of voters btn 6-9am across Ke. I was a DPO in this election.Guliye is LYING to our faces!! That KIEMS kit is set to transmit figures not exceedng the total reg. voters. That's how your & my taxes are being misused...why invest in alleged tamper-proof system that failed to deliver as promised​? Why pay tax?